Although posted yesterday, the following Oracle Report speaks to potent energies and alignments through this Wednesday’s Full Moon in Capricorn. Some people have even been calling this Jupiter-Venus alignment a “Return of the Star of Bethlehem.” Having grown up in Bethlehem (PA), with its huge star on the small mountain overlooking the city, I find this intriguing, but I’m not personally anticipating any imminent “return” unless Project Blue Beam gets activated. Here’s a short video describing this “superstar” effect happening today, although the narrator indicates “no effect on Earth or human affairs.” I guess time will tell. Meanwhile, enjoy the view, and do your best to make the most of these alignments! Clarity about direction, course, senses, intuition, beliefs, information, and assessments is delivered. The energy that is building provides guidance and information — special messages that guide. The energy is “exalted” somewhat since Jupiter is involved. Jupiter teaches us things that stretch our minds, so whatever is happening now is designed to bring things to a much higher and expanded level. Since Venus is the other planet involved, energy is added to what we value and love, taking those things to new levels as well. This lofty event has a caveat. The conjunction of Venus and Jupiter makes an astrological aspect with Uranus. Uranus’ goal is always to change, adjust, or align us with what is in our highest and best interests. We are just beginning to grasp the expanded perception, awareness, and insight that is on tap until the Full Moon and the Venus -Jupiter conjunction overnight Tuesday (exact conjunction of Venus and Jupiter is Wednesday, July 1 at 3:33 am ET/7:33 am UT). Until then, the magic of the Gibbous Moon phase continues to flow. This month’s specials reflect requests and sharing from recent sessions and emails. The two specials actually complement each other well, since positive (yet dramatic) timeline shifts can feel a bit bumpy, while Reiki helps to smooth and ease transitions. Singly or together, I hope you find this month’s offerings supportive of the intense energies, longings and opportunities continuing to explode on the scene these days. The reading gives you a heads up regarding the types of feelings, thoughts and experiences to watch for if you’re looking to sidestep onto a more positive timeline without needing to slog through linear time to get your desired life. These “timeline hops,” “portal points,” “reality jumps” — whatever you want to call them — are not only possible but powerful, and with awareness and practice, you can learn to surf such opportunities, charting your own course from current to next closest to preferred realities. $133 if prepaid by 6/30/2015. With all the intensity flying around these days, it seems like a good time to run a Reiki special. Reiki is an ancient healing method rediscovered in the 19th century by the Japanese monk Dr. Mikao Usui. The “Rei” in Reiki stands for “universal” or “spiritual,” and the “ki” corresponds to the “life force energy” known as “Chi” or “prana” in other Eastern systems of healing and energy work such as feng shui, Tai Chi, Qigong, or yoga. Thus, Reiki refers to “universal life force energy,” “divinely directed healing energy,” or “life energy of a spiritual nature,” with an emphasis on subtle energy fields rather than the physical body. By working on all the different levels, Reiki helps the body to relax into a state that allows optimal self-healing. Reiki sessions typically last one hour and occur at a distance, usually set to deliver while you’re sleeping and most receptive. If you prefer to be awake and meditating during your session, we can also schedule for a specific time that works for both of us. Gentleness and synchronicity are both hallmarks of Reiki sessions. If prepaid by 6/30/15, Reiki sessions are $77 instead of the usual $85. Please contact me to sign up. I’m really starting to enjoy this maturing garden. 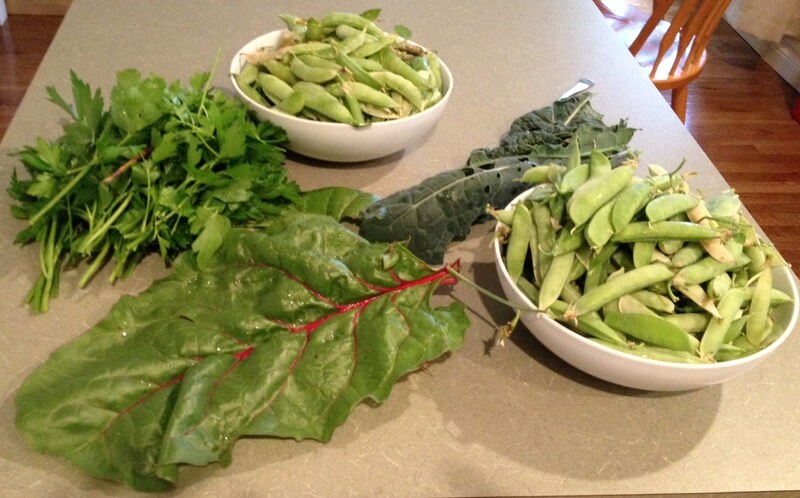 Even though the yard remains far more than a part time “job,” each year, more and more plants bear fruit, perennials and bulbs take off, and I have greater success with multi-season crops. 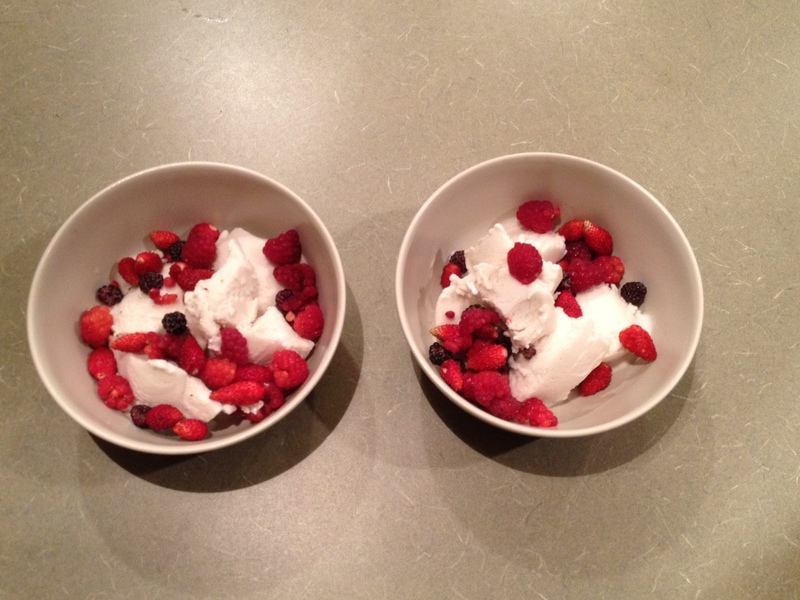 This week has been heavy on the garlic, shallots and peas, although I’ve also harvested impressive amounts (for second year plants) of various berries, which we’ve enjoyed in smoothies and our favorite way: over vanilla coconut ice cream! 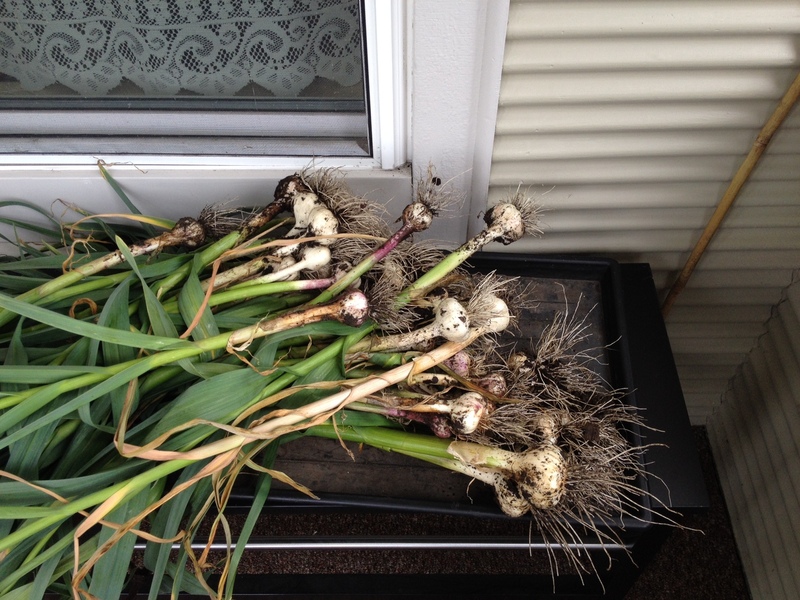 About 1/4 of our garlic, which I planted all over the yard. Imagine my delight in finding the largest bulbs grew in a former black walnut area where few other things grow! 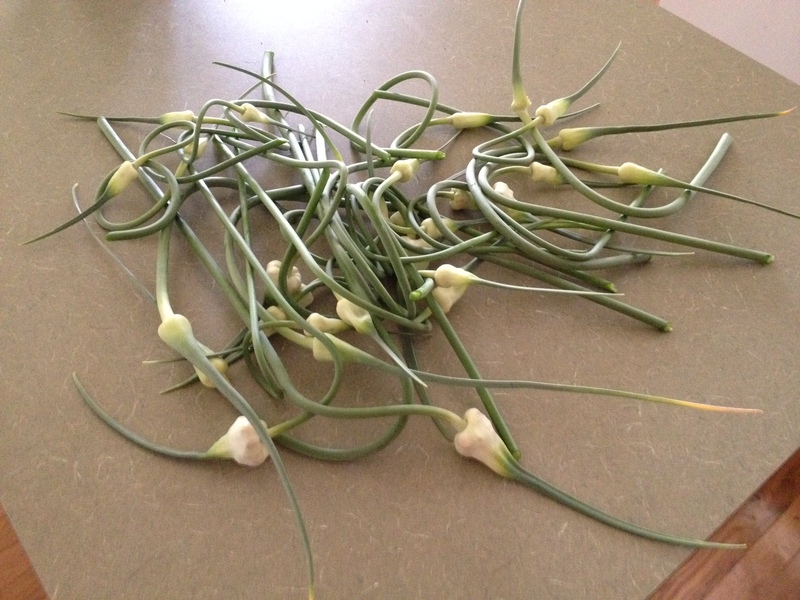 Don’t forget the garlic scapes, bursting with flavor in curries, Italian dishes and stirfries. 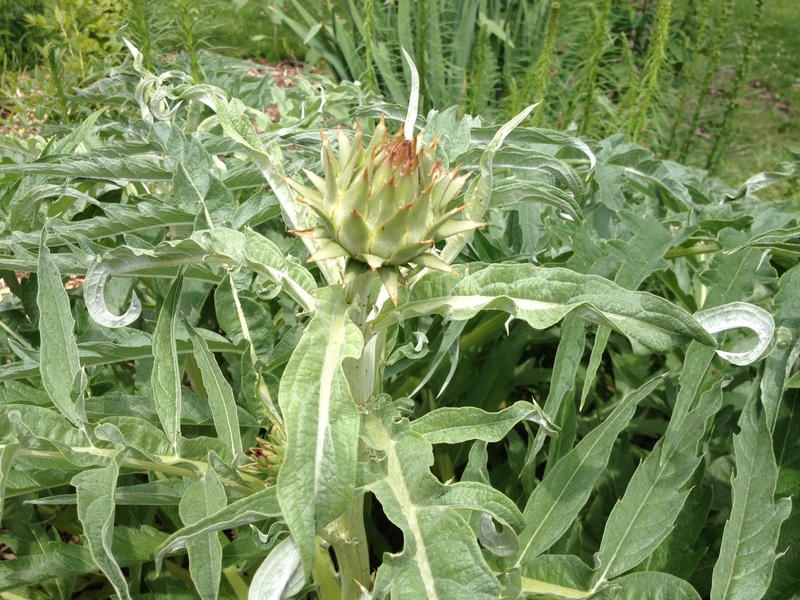 Our cardoon (related to artichoke) is getting ready to put on a show for the bees and butterflies! 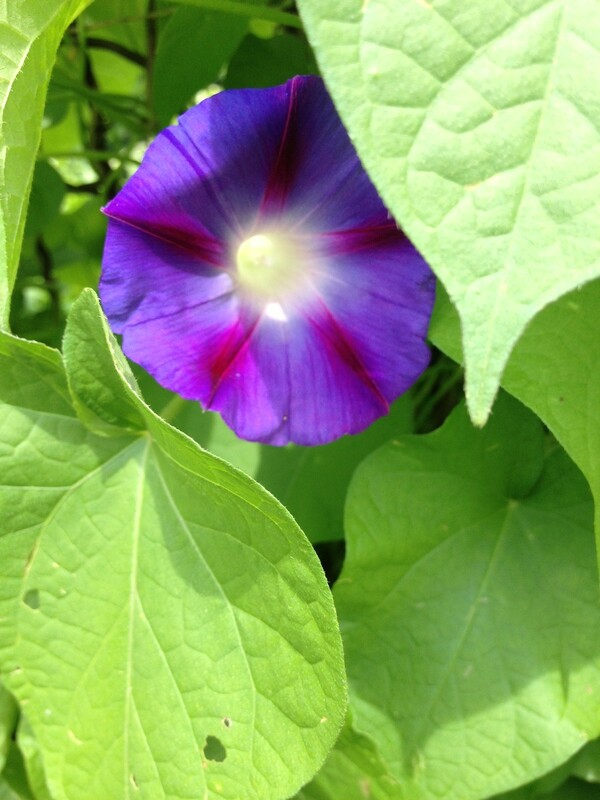 The season’s first morning glory. The Garden Tower continues to wow visitors and produce a lot of food and flowers. Robinhood roses out front are very popular with the bees. 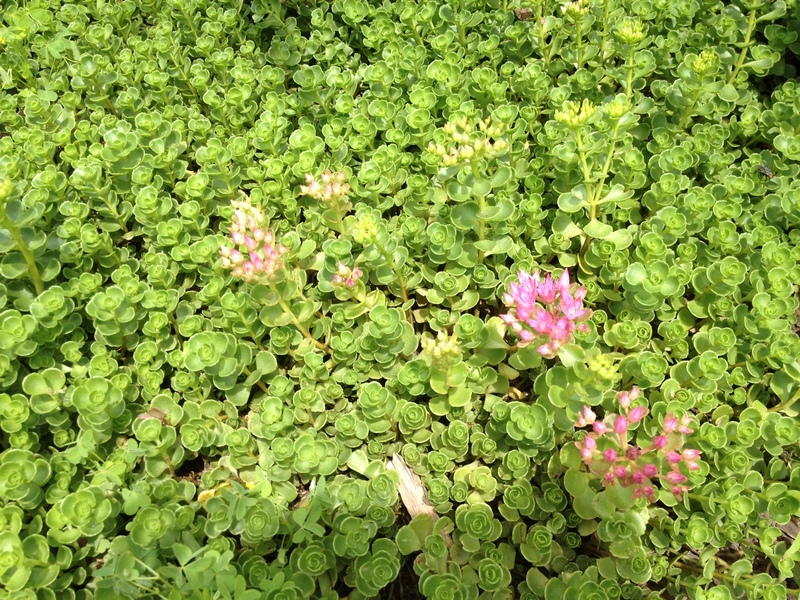 Last year’s sedum groundcover has finally begun to cover ground … and to bloom. 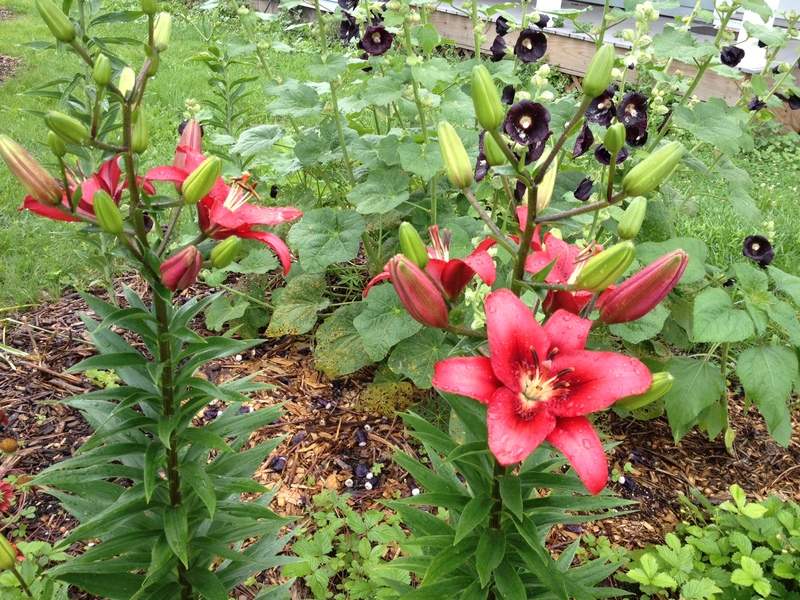 Lilies, hollyhocks and wild strawberries going to town in the black walnut area so well favored by the garlic. I also have Garden Giant mushroom spawn there, so I wonder if that has anything to do with these extra happy plants. 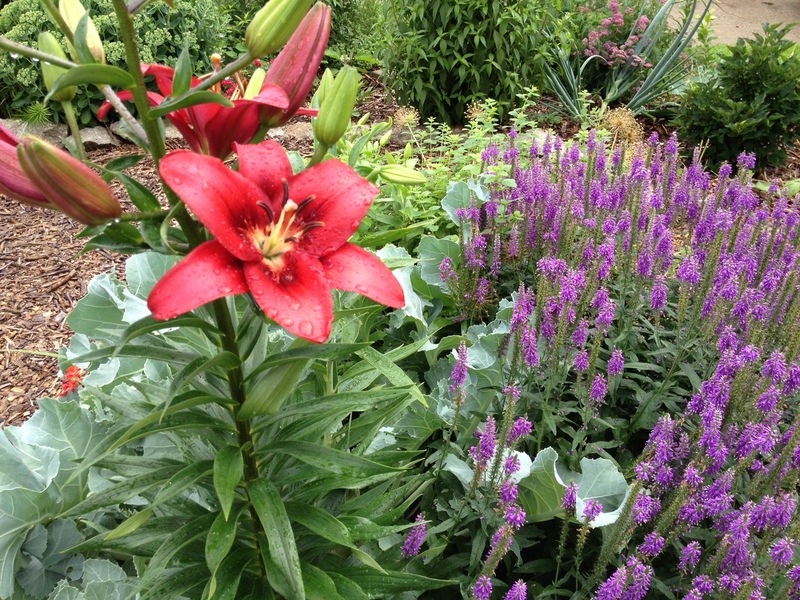 Lilies, Veronica, sea kale, chard, dwarf Korean lilac, black eyed Susan’s and more in the curving paths and beds up front. Yesterday marked the arrival of more (yes, more!) hazelnut trees, blueberry bushes and a butterfly bush, along with a huge wheelbarrow full of my friend Kimber’s awesome soil from an area she needed dug out. Note to self: a cart full of rich soil sounds much easier to pull for a mile than it is. Never. Again. But the hazels will appreciate a better start. 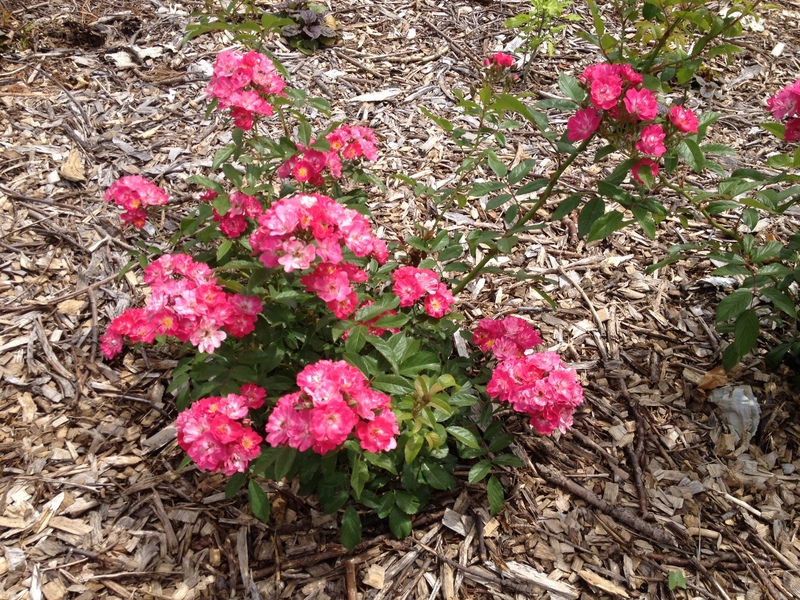 Our yard’s becoming like one of those clown cars: just how many trees, shrubs, perennials, bulbs and annuals can I fit? Oh, you’d be surprised. I hear a witch hazel calling my name. Winter blooming, juglone (black walnut) tolerant, and medicinal? Check, check, check. And a good dowser, to boot! I hope you enjoy the abundance and beauty, and please know that not every garden project needs to be this extensive. I feel called to regenerate this land, and each tree planted feels like a dear friend. Each flower that blooms makes me smile, and each just picked meal gives our bodies such wonderful nourishment and taste bud delight. If you can’t ever imagine planting or harvesting this many things, that’s OK. Maybe you’re not called to do so, but do plant something. Your heart and your planet will thank you! Right now, we’ve got way too many would be cooks and spell casters in the kitchen. Now is the time for individuals to ask: “Do I trust the media, Artificial Intelligence, the CIA, FBI, Monsanto, Banksters, politicians, top down religions, and/or shadowy NGO’s to make my brew? To create my own healing elixer? To feed me nourishing soul-utions?” If not, then kick those usurpers out of your kitchen and get busy! Dots/Ingredients for your selection or conscious rejection. Saturn In Scorpio –Summer Intensive in Mind Control Written by Molly Hall, this article looks at the astrology of Mind Control — which, it turns out, offers powerful aspects supporting Jade Helm’s desire to “Master the Human Domain,” including a bunch of psyops and mind controlled TV memes just in time to whip unsuspecting swallowers and followers into orchestrated behavior. We’re talking actual spells here, supported by Saturn in Scorpio, not simply turns of phrase. Molly also offers alternatives — how we can use this Summer’s energies to free ourselves instead of joining what seems like an invocation of a literal Zombie Apocalypse. Jade Helm AI A SuperSoldier reveals the connections between CERN, Jade Helm, AI, international trade agreements, preemptive troop placement, and what “Master the Human Domain” means according to the official Jade Helm reports and papers. Why Is Google Building a Robot Army? Popular Science article exploring Google’s strange dedication to creating an army of AI robots. “Those Who Routinely Slander the South are Bigots,” posted on Malcolm’s Round Table. I went to school in the South — at UNC-Chapel Hill, and, like this blogger, I’ve found the double standard both disturbing and unwarranted. Having lived in and traveled around the South during college, I felt the racism and racial segregation of Chicago as an unexpectedly hard slap in the face when I moved there for graduate school. Living now in Northern Indiana, I can say that the South is not the most racist area of the country. It’s different, yes, but if you haven’t lived there and many other places for comparison, then please don’t simply swallow stereotypes, especially when artificially manipulated and enflamed in order to trigger another “Civil” War. We can’t shame or legislate tolerance, and true compassion and respect don’t mean we’re all the same. That’s also why I reposted my book review of Will Allen’s “The Good Food Revolution.” Here’s a black man, married to a white woman, the son of a sharecropper, and a person acutely aware of racism, who neither trashes the South nor accepts bigotry nor a victim mentality. Instead, he has created entire systems and beautiful ripple effects by recognizing the humanity in each individual, regardless of color, creed or origin. We can all learn so much from him. 25 Powerful Photos Showing Human Compassion. Moments like these spell hope for humanity. Art, Imagination and Magic an article by Jon Rappoport, one of the staunchest advocates for life beyond the automaton. The Great Cosmic Mother: Rediscovering the Religion of the Earth, by Monica Sjoo and Barbara Mor. Not the Pope’s version of planetary alignment, this book will blow your patriarchal dominated mind and provide new context and models through suppressed history of the Goddess and empowered Feminine. My Amazon review: “This book blew me away in its scholarly approach to ancient folk songs and the bardic tradition and what these reveal about true magic and UnderWorld initiation. My brain kept going off like popcorn as RJ Stewart explained (in depth and through tradition) conclusions that I’d drawn through personal experience. I love that he’s not in any way, shape or form a New Age fluff bunny, and he shares my frustration with how watered down, black/white, and disempowering most versions of “spirituality” have become. I was pleasantly surprised to find his insights into Christian tradition both deep and engaging. I loved this book so much that after three chapters I went on his site and ordered another four books to go along with this one and the two others (as yet unread) that I ordered from Amazon. I can’t recall any other author I’ve ever done this with before or since. Feel free to mix and match and bring in your own ingredients. After all, it’s your brew, your stew, your New. It’s been on my heart to reblog this post for several reasons, but especially now that the media is so flagrantly reinvigorating its attempts to start a race war in this country. “The Good Food Revolution,” by Will Allen offers incredible inspiration on so many different levels. In addition to urban farming, turning a depressed, toxic area into an amazingly productive organic farm and eco-model for home gardens, inventions (i.e. 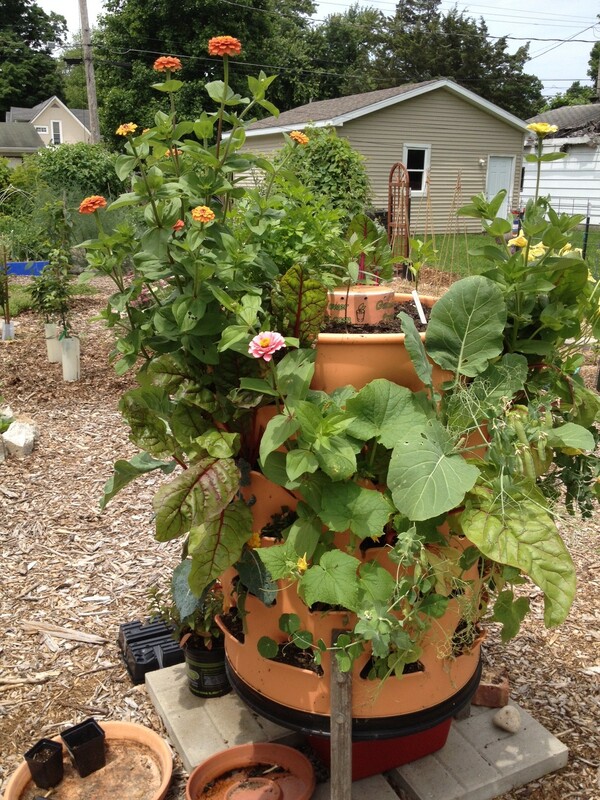 the Garden Tower Project), vermicomposters and aquaponics farms, Will Allen shares some tremendously valuable (and surprising) insights about race relations and black history in the US. I recommend this book for all the obvious reasons, but right now, I hope people will read Will Allen’s words, feel his stories, and let them sink in and transform lives. This man walks his talk, and his wise, humble words are sure to awaken and heal some of the deepest scars across our land and culture, as we create new possibilities for abundance, respect and empowerment. A few weeks ago, we enjoyed the privilege of listening to Will Allen, CEO of Growing Power, at the Nanovic Institute’s “The Future of Food” Symposium. On our way back from lunch, David and I got the chance to speak privately with Will, so we decided to buy his book and have him sign it. I expected to learn about urban farming and community outreach, but little did I know how riveting I’d find “The Good Food Revolution“! Thanks, Ann, for this excellent summary. The link to the article called, “Pope Francis: Care for Our Common Home” is especially worth reading.